A Call for Prayers for Mukunda Goswami ~ The Toronto Hare Krishna Temple! The following article has been posted on ISKCON News. We ask all devotees and well-wishers of our Toronto Hare Krishna community to offer their prayers for the health and recovery of Mukunda Goswami. 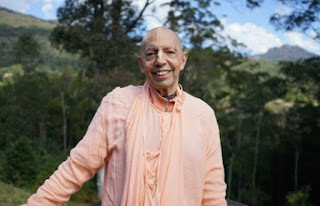 His Holiness Mukunda Goswami, an ISKCON pioneer, guru, and one of Srila Prabhupada’s very first disciples, has undergone a successful triple-bypass surgery after suffering a heart-attack. However devotees worldwide are still praying intensely as he prepares to undergo another high risk surgery on his hip tomorrow (Thursday October 29th). On the night of October 22nd, Mukunda Goswami – respectfully known as Maharaja -- slipped at his residence on the ISKCON New Govardhana Farm in Australia and broke his hip. As they assessed him for surgery on the hip, doctors at the Tweed Hospital on Australia’s Gold Coast detected an underlying heart condition, and canceled the hip surgery due to the risk of further heart complications. During the night of October 24th, Maharaja suffered a heart attack, and was transferred to a larger regional hospital. There, he was scheduled for a triple-bypass heart surgery. Despite his condition he was in good spirits as he awaited surgery. “He was chanting Hare Krishna, listening to recordings of Srila Prabhupada chanting the Holy Names, and his disciples were also reading Srimad-Bhagavatam to him,” reported Nitai Chandra Das. Nitai Chandra’s father, Krsna Kirtan Das, is caring for Mukunda Goswami and liasing with hospital staff along with Vishnujan Das and Madan Mohan Das. “We read some messages to Maharaja from Godbrothers and sisters, disciples and wellwishers, and he was pleased to hear them,” added Malini Durr. The six-hour triple bypass surgery was a success. Afterwards, his heart was beating on its own, which doctors called “the best case scenario” given his pre-surgery condition. But prayers are needed now more than ever. Maharaja is currently in the Intensive Care Unit, and his orthopedic surgeon plans to operate on his hip tomorrow. According to the surgeon, as well as the general risks of the operation associated with old age, Mukunda Goswami is especially high-risk due to having just undergone a major surgery on top of his already weak heart. However, delaying the operation also carries a high mortality risk, as Maharaja’s lungs have begun to rattle because of his long period of immobility in hospital, which increases the chances of pneumonia. So, doctors say, getting him up and moving is extremely important. More news on the outcome of the operation will come very soon. Of course, visiting will not be allowed until after a substantial recovery time. “[In the meantime] We now beg all of you to please pray to Srila Prabhupada, Gauranga Mahaprabhu and Lord Nrsimhadeva,” says Krsna Kirtan. Mukunda Goswami was born as Michael Grant in Portland, Oregon. After graduating from Reed College he became a professional jazz musician and moved to New York to pursue his music career. In 1965 Michael met the Hare Krishna founder A. C. Bhaktivedanta Swami Prabhupada. The next year he was in the first group of initiated disciples, receiving the Sanskrit name Mukunda Dasa. Mukunda was a pioneer in the early days of the Hare Krishna movement. In 1966 in New York City he helped Bhaktivedanta Swami rent a storefront for the first Hare Krishna temple. In 1967 he founded the first Hare Krishna temple in San Francisco and organized a major music event, the Mantra-Rock Dance. Mukunda Goswami has been a spiritual leader (guru) for many decades within the International Society for Krishna Consciousness.